Coming back to markets and trading (after a while), the feeling has been that the markets, and the economy as a whole, are doing good. How good? Since I haven’t been following things closely, I had to do some forensics. As of Friday, President Trump’s rally is standing at 24.76%. That qualifies it as the 3rd best in more modern history (I will come back to this later). At least on the Dow Jones Industrial Average. It is easy to see that on two occasions, in the middle of the chart, as well as around first 30 days, President Trump’s rally was in fact on top. It is also worth noting that up to this point, only President Clinton’s 2nd term rally and President Trump’s rally lifted the markets to new highs. President H.W. Bushes rally was running on the back of the calamitous but short-lived recession of 1987. It had to run for a while longer before hitting a new high. To put the current 24.76% into perspective, a genuine question to ask is how big is the typical return over 234 days? The answer is a “meager” 7.62%. In other words, 88% of the times, the return over 234 day has been lower than the current return of 24.76%. The picture on the S&P 500 is somewhat different. There President Trump’s rally is at around 20%. If you are curious – here is the R code to get you started. Currently Yahoo provides the Dow Jones only back to 1985. To go further in history, you need to dig up the index from elsewhere. I had it in a data set I purchased a while back. There was one bigger rally in history. It was monstrous. President Roosevelt’s (first term, elected in 1927) rally was up to 60% at this point! But … it was very volatile. At the 30 day mark it was 20% in the red! Hmm, what was going on I asked myself. Well this was the bottom of the Great Depression! The market has dipped 80% over two years and was starting to rally. All in all – the market has been doing great. At least since election day. And the market data is not alone: labor and other economic data confirms. 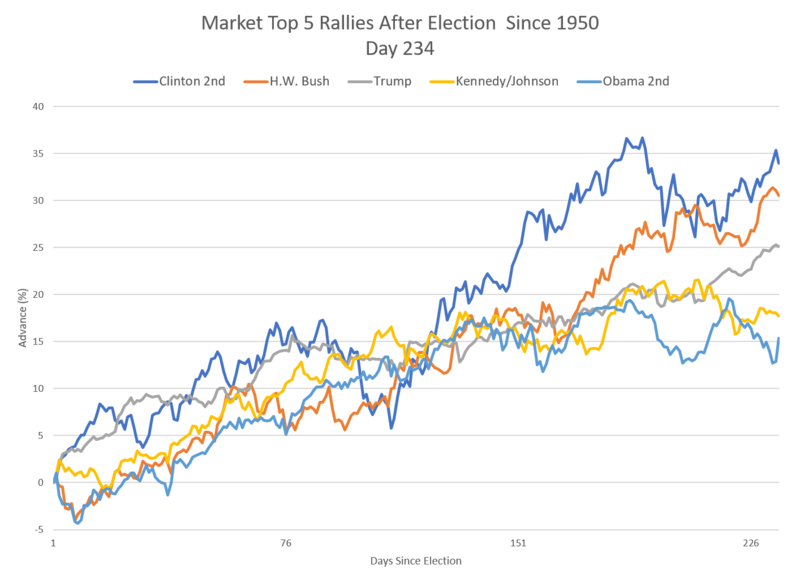 The post Markets Performance after Election appeared first on Quintuitive.